by supporting their natural healing abilities. the body can heal itself. Nedda Wittels is not a veterinarian or animal trainer. These services do not constitute diagnose or treatment of physical, emotional, or mental illness. When there is serious illness, injury, or mental/emotional problems, a veterinarian of your choice should be consulted. These services are not a substitute for medical treatment. Intuitive Healing is a form of energy healing. Healing may be done "hands on" or from a distance. I offer distance healing sessions for animals anywhere on planet Earth because physical distance is irrelevant to the success of a healing session. The body's innate healing abilities are enhanced in a healing session by modulating the energy flow, clearing blockages, and assisting the body to restore normal levels and movement of life force. The body already knows how to heal itself. Intuitive Energy Healing provides energetic support for the body to do what it naturally know how to do. For this reason, no one, not even a medical doctor, can predict how quickly or completely any individual will heal. Each individual is unique. Each situation is unique. To a very large degree, it's up to the individual to choose how much and how quickly they will heal. A healing facilitator, working with healing experts from the higher realms, creates a supportive space for healing and facilitates the work of the healing "experts". Then it's up to the individual's body to do the rest. Both humans and animals release old patterns in layers. During and immediately after an individual session, the person or animal may feel much better, only to feel worse again soon after the session as anther layer rises to the surface to be released or healed. This is why multiple sessions may be necessary to achieve a healing goal. Stagnant energies are released and replaced with pure life force energy, Divine Love and Divine Light to allow the body's own healing mechanisms to function optimally. Emotional and mental blocks are removed or dissolved, restoring appropriate flow of chi (life force energy) . Optimum physical, emotional, mental, and spiritual well-being is encouraged through the use of intentions. Bring a relief of symptoms, including physical and emotional pain. Strengthen the immune system to help eliminate unfriendly micro-organisms and other parasites. Accelerate mending of broken bones and damaged soft tissue. Repair the body's etheric blueprint or template, which helps the body's natural healing process to be more effective. When our animal friends feel physical, mental, or emotional pain, symptoms of disease, or injury that requires surgery, we want them to feel better as quickly as possible. We want the pain and other unpleasant symptoms to go away. In western society, we have been taught to expect a "quick fix". We want to "pop a magic pill" into the mouths of our animals and give them instant relief. This approach can sometimes mask symptoms and even create side effects that may interfere with the body's own natural healing processes. Many times a complementary or alternative approach to healing provides the best results. In addition, emotional and mental patterns that have built up over one or more lifetimes may take much longer to heal, especially when karma is involved. Initially, a series of 3 healing sessions scheduled close together may be required to facilitate sufficient momentum to reach a new healing plateau. Sessions for an individual animal may be purchased individually, or as part of a package. During a healing session, I work with teams including healing masters and angelic beings. Techniques and elements from these and other modalities may be used. By combining Animal Communication - by speaking with your animal telepathically to check in on how the animal is handling the energy and what issues may be coming up during the healing session - I can facilitate a more complete healing experience. Intuitive energetic healing offers profound assistance to your animal's healing process. In my experience, an Animal Communication session is necessary as a way of determining whether or not intuitive healing is an appropriate modality. By speaking telepathically with your animal, and with the animal's permission, I can feel what your animal is feeling physically and emotionally, so that the multidimensional aspects of the situation are not overlooked. During the session, I seek to understand what's going on from both your perspective and that of your animal. I will also discuss with you any veterinary and other input you can provide. for an intuitive healing session to be scheduled. After a healing session, your animal companion may experience a variety of changes and improvements in their physical, emotional, and mental state. Specific improvements will vary for each individual and their body's natural healing process. Please note that sometimes changes that seem small to you are very significant in the overall healing process. Between healing sessions, brief update sessions at no additional charge will be scheduled for you and me to review your observations and for me to share my insights and what took place during the healing sessions. I do not usually speak telepathically with the animal during these 10-minute check in sessions. FASTER and MORE COMPLETE healing from illness, injuries, and surgery. REDUCED pain or no pain at all; more comfortable moving around; more frequent getting up and lying down; longer periods up, and other variations. INCREASED relaxation in mind, body, and spirit. FEELING more energized and playful; wanting to spend more time with others in the family. BEING more balanced and grounded; more peaceful. To gather information from you and your animal about what is going on - what you observe, what a veterinarian diagnosis might be, what other treatments have been and are being used, and how your animal is feeling. To determine whether a healing with me is appropriate for this particular animal and this particular situation. The animal must be willing to receive the healing, and feel comfortable with me facilitating the healing. The animal must give permission for the healing to take place. The healing session is usually scheduled for a time after the phone session is completed. This allows me to totally focus on the process of facilitating the healing work. It is recommended that the animal be resting, or at least not involved in any activity which requires a large expenditure of energy. The session is scheduled for a time when the animal is likely to be quiet. The body already knows how to heal itself. By creating sacred space and tuning into the Divine Energies of Creation, the healer becomes a channel for "Love without conditions." This energy is sometimes called life force, chi, ki or prana. Today, there are many higher vibrations of Light and Love available for healing purposes. Encourage your animal companion to rest and be quiet for 24 to 36 hours. This allows the energy to be used for healing. If your animal is sleeping more than normal, do not be concerned. If you are concerned about anything that is happening or not happening, please telephone me. Some animals may feel exhausted and want to rest or even sleep; others feel very energized and bouncy. Nevertheless, please encourage them to REST. For horses, show dogs, and other "working" animals, please give the rest of that day and all of the following day to integrate the healing without requiring any work whatsoever. Dogs should not go on hikes in the mountains, compete in agility or any other competition, and should be encouraged to be couch potatoes. Horses should not be ridden or involved in anything more exciting than turn out (or stall rest when that is appropriate for their injury/illness). Cats? Well, who can tell a cat what to do? Still, rest is to be encouraged and confining your cat to one small room with a "cat cave" can be helpful with a young energetic animal. A "cat cave" is a cardboard box with the opening on the side. Put something soft in the box for the cat to lie upon and drape a towel over the opening, leaving only about 1" of space between the towel on the floor. The cat will probably crawl right in and enjoy the comfortable spot you've provided. This helps their body detoxify after a session. A FOLLOW-UP APPOINTMENT is recommended to evaluate the healing session. During a brief 10 minute phone call, you are encouraged to report your observations. Sometimes the animal's input is also requested. This information helps us decide whether and/or how soon an additional healing session would be advisable. Preparation for surgery is a very specific type of intuitive healing session. Whether an animal is being neutered or spayed, has been injured in an accident, or is having any other type of surgery, appropriate preparation for the surgery creates many benefits. A feeling of comfort and calm that will put your animal in the best possible frame of mind to experience the surgery. The animal's physical body is prepared to receive the surgery and therefore can adjust to whatever changes are required. Set up the physical space by coordinating with the angels and nature spirits to clear the surgical preparation room, the surgery itself, and the room where recovery from surgery will take place. This process eliminates energies that are discordant and no longer appropriate for the Earth realm and sets up a healing energy for the space. When the clearing is complete, the space is filled with Divine Light and Divine Love and set with intentions to create safety and optimal healing. Coordinate with the “I Am Presence” of everyone on the surgical team to allow them to release anything that is no longer appropriate for them and to set intentions so that they will be in their best mental, emotional, and physical states to perform a perfect surgery. Facilitate a balancing and clearing of the bodies of the animal or person receiving the actual surgery to promote optimal results. Rapidly and completely heal at all levels. Integrate any foreign materials that may be placed into the body, such as artificial joints. Be deeply relaxed and at peace throughout the surgery and recovery process. Adjust the etheric matrix and template for the body to accommodate the surgery. Release and heal any emotional and mental patterns that may have contributed to creating the situation in the first place. Prepare any body parts that will be removed so that there is minimal stress and bleeding. Set whatever additional intentions the individual has chosen for the surgical outcome. Cookie when the mass was discovered. 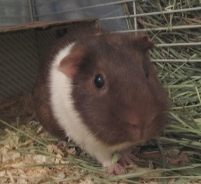 Cookie, our 7 year old guinea pig never complains. She is active, cheerful, and strong willed. So when we were told by a friend who was watching her that she felt a large mass in her neck, we were stunned. Cookie didn't appear to be in discomfort, although she'd curiously rest her head on her food bowl. I thought, well what is the vet going to do for a 7 year old guinea pig with a mass? I was saddened at the thought. I took her to the vet the next day, and since he was stunned at her good health at such an advanced age, opted to operate the next day. Little did we know that Cookie would be in for a much longer recovery than expected. She was traumatized by the surgery, and was not eating for days afterwards. She was in and out of the hospital, and had more anesthesia to grind down her teeth, because she wasn't eating. Initially we thought it was a mistake to have subjected this happy and otherwise healthy guinea pig to this kind of surgery at her age. We weren't hopeful she would live through this. At that time, I called Nedda for help. Nedda spent some time talking with Cookie who had much to say. Cookie told Nedda she was so upset at the whole ordeal and when I mentioned to Nedda that there were plenty of orbs around her cage before surgery, Nedda asked Cookie about them. She told Nedda that she was talking to the angels, but wouldn't elaborate. Nedda asked Cookie whether she was willing to accept a healing, and she was reluctant although willing. During the healing, I noticed that Cookie looked calmer and more peaceful than even before surgery. She curled up and fell asleep. Needless to say, every day after that Cookie got stronger and started eating on her own. Incidentally, the orbs disappeared at that point. Interesting! I called Nedda for a second healing when I found a mass on her underside. This was very distressing, because in no way were we going to subject her to another surgery. At that point when I asked Nedda for a healing of her new mass, I wasn't hopeful. How could it just disappear? Now we were tempting fate, I thought. A few weeks after Nedda's healing, I felt NO evidence of this protruding mass! I couldn't believe it! On a final note, I contacted Nedda for a third healing when Cookie was having lots of rectal/bladder pain supposedly from a bladder stone. She got another healing and this time Cookie was willing to accept it. The day Nedda gave her a healing she had lots of pain and blood in her urine. The very next day, the pain had subsided and the blood was completely gone. Cookie, feeling like her old self. I believe wholeheartedly in the miracle and power of energy work. With love, patience, kindness, and prayer we can work to heal this world one person, and one animal at a time. Nedda is one of these special miracle workers! A horse trainer from Kentucky called and asked me to speak with a gelding named Pete who was being trained as a show jumper. Pete had been abandoned by his previous owner and the stable wanted to show him as a hunter/jumper so he could be sold to pay his board. He was so badly behaved, the trainer feared he might be hopeless. According to the trainer, Pete couldn’t seem to tolerate any leg contact and would spook at everything. Training him was extremely difficult because it was hard to keep his attention. Since jumping requires a great deal of concentration, the training wasn’t going very well. The trainer said, "Anything you can suggest to help this horse will be appreciated." As soon as I tuned in to speak with Pete, I felt that he was having trouble staying in his body. With his permission, I scanned his energy. Immediately I felt as though I had put my hands into a nest of stinging hornets . No wonder Pete was spooky and could barely tolerate a rider! He could barely tolerate to be in his own body! The trainer agreed to try three energy healing sessions. Pete improved after the very first one. He was calmer under saddle and better able to listen to the rider. He was also more grounded. The trainer and I reviewed his training methods to brainstorm ways to improve Pete’s comfort even more and to help him stay grounded under saddle. After two more healing sessions, Pete had made dramatic progress. The “bee sting” energy was gone. Now Pete was settled more comfortably into his physical body. He was able to pay attention to the rider’s cues and to what he was doing while being ridden. With patience and understanding, and with a major shift in his energy, Pete was headed for a better life. Simba's fight for survival took place in 2001. Today, 2014, Simba is healthy and going strong. My niece's divorce brought Simba, a Rag Doll cat, to our home. I invited Nedda to come to the house to help Simba integrate with our two other cats, Chandler and Tash, but when she met Simba, Nedda was immediately concerned about his appearance and especially his breathing. Every breath Simba took was labored. Nedda urged me to take him to the vet right away and to keep the other cats out of the room. Simba had fluid around his lungs, diagnosed as idiopathic chylothorax. My veterinarian wasn't very optimistic. There was so much fluid that the doctor didn't remove all of it on the first visit. Simba would have to come back again and again to have the fluid removed if he was to survive. I brought Simba home determined to help him get well. Nedda suggested some flower essences to help Simba with the depression he felt, largely related to his attachment to my niece. She had raised him from a kitten and he was both sad to leave her and upset by the personal upheaval she was going through. For a few weeks, Simba seemed stable, but did not improve much. He didn't like the more nutritious diet Nedda suggested I feed him and wasn't eating very well. He was used to junky cat food from the supermarket. All I could get him to eat was freshly cooked turkey. Removing the fluid helped for a day or two, but he had to go once every week to have it done. During this time, he was seen by 3 different veterinarians at the same practice, and each one said there was no hope. I knew in my heart that they were wrong. I just had to find the answer. One day, Nedda suggested a series of healing sessions. She explained that energetic healing is cumulative in effect, and for such a serious condition a series of 3 consecutive sessions over 3 consecutive days might start to turn things around. I agreed to try it. I saw immediate improvements in Simba after the very first session. He began eating better and had a little more energy. Nedda urged him to use his energy for healing and not become too active just yet. She also enlisted the help of the other cats, especially Chandler who began sitting outside the door of Simba's room yowling. I thought he might be threatening Simba, but Chandler told Nedda that he was singing songs of encouragement. When the cats met nose-to-nose through a screen, there was never a hiss or a growl. Meanwhile, I gave Simba homeopathics, dietary supplements, and special food, and used prayer and color therapy to help him heal. Simba kept slowly improving. He gained weight. His bedraggled coat shed out and became soft and beautiful. He began to play with the other cats and asked to go outside from time to time. But he still needed to have fluid removed once a week. One day, Simba took a turn for the worse. I called Nedda, who did another healing. This time, the change was dramatic. When I took him for his weekly visit to the vet, one whole side of his lungs were clear of fluids. Simba had turned a corner and went for two whole weeks without needing any fluids removed. During that time, he played with the other cats, spent more time outside, and his appetite increased dramatically. Simba was so much better! At his next visit, the vet took out half as much fluid as before. Yet when we got home, Simba refused to eat or play, and moped around the house. I called Nedda the next day because I couldn't figure out what was wrong. When Nedda talked telepathically to Simba, he told her he was depressed. He believed he was not getting better. After two weeks of not going to the doctor, he thought he was all done. Then, because he had to go back, he decided he must not be healing. He was depressed because of this misunderstanding. Nedda cleared up the confusion for him. She said it simply wasn't true that he wasn't getting better. She explained that getting well can take time. She reminded him that two whole weeks had gone by between fluid removal treatments. She told him how much everyone loved him and wanted him to heal. As Simba and Nedda finished talking, I was amazement to see him walk over to the food dish and eat enthusiastically for the first time in 24 hours. When he was through, he began playing with a toy that was lying on the floor. Nedda had talked him through an important emotional shift. He was back on the road to recovery, and in just a few more weeks, Simba had entirely recovered. Our dog, Vinnie, came to us from an animal rescue organization. He had been found injured along a road, and had to have disk fusion surgery on some of his neck vertebrae. Soon after the surgery, my wife and I saw Vinnie, fell in love with him, and brought him home. Although the veterinarians said the surgery went well and expected his neck to heal after awhile, 3 months later we were still concerned that he wasn't making enough progress and was in pain. We called Nedda and asked her to speak with Vinnie telepathically. Despite pain medication, Vinnie walked with his head hung down, his lower back curled under, and often held his right paw up, unwilling to put his full weight on it. He told her he was still in pain and was discouraged. Nedda suggested some healing sessions. She explained that it wouldn't matter whether we were home with Vinnie or at work. She said she could do the sessions from a distance. We decided to give it a try. After the very first session, it was clear that something had changed profoundly for Vinnie. That very evening he was holding his head up more and putting more weight on his right front foot. His eyes seemed happier. When we talked to Nedda, she described what she had found during the healing. . "I saw an image of Vinnie being thrown out of a car. Apparently, his spinal injury occurred as he landed, and all his emotions were locked into the damaged portion of his neck. The healing session was very emotionally intense as his body released his sadness, anger and grief." She explained: "Because the initial injury and surgery took place several months ago, Vinnie’s body has been compensating for his pain and his difficulty moving. That's why he was tucking his back end under him - that position makes it easier for him to balance his head and hold up the right paw." Nedda suggest a series of healings to clear stagnant energies, reduce the pain and inflammation, and support the body’s natural healing process. My wife and I immediately agreed. Between early March and late April, 2001, Vinnie received a total of 7 distance healings. Each time, we could see marked improvement within an hour or two of the session. Today, Vinnie is on a “maintenance” program, receiving healings about once every 2-3 months. He rarely needs pain medicine. He's a happy dog, able to run and play with our other dog without restriction.